This creamy and delicious nut free alfredo sauce is the perfect way to celebrate fall time. 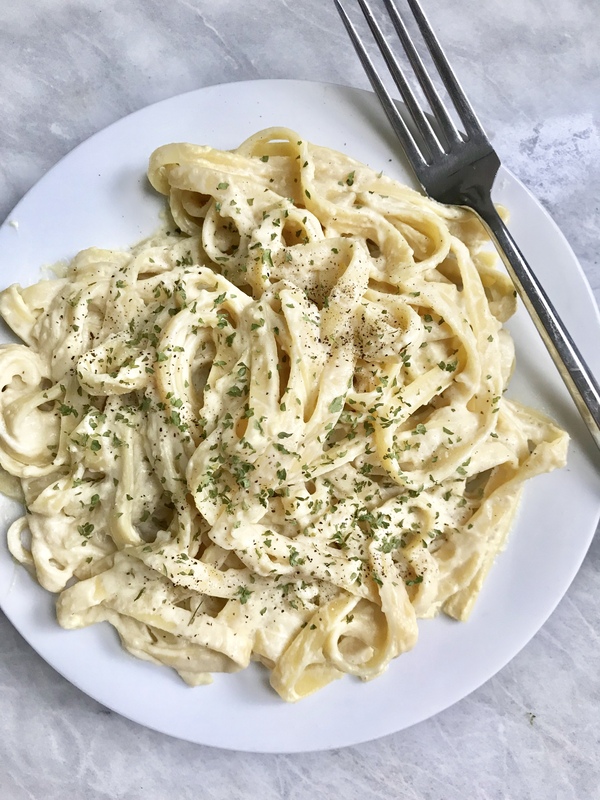 I’ve been wanting to update my cauliflower alfredo sauce for awhile now! My original one was posted around this time last year and has definitely been a hit for you guys as well as my family. However, I wanted to jazz it up a little more using different ingredients while still keeping that base of cauliflower. If you didn’t know, cauliflower is quite the vegetable. You can make it into rice, bread, and even use it as a base for creamy sauces. 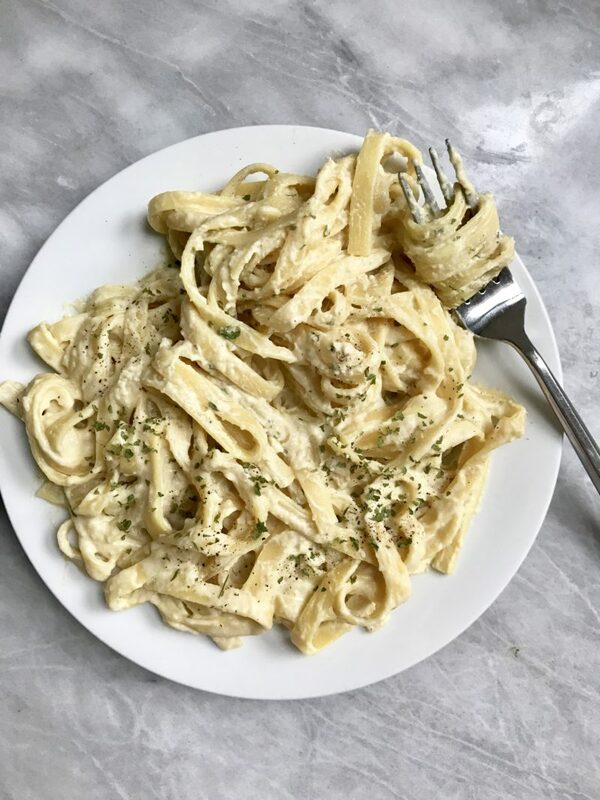 It’s a great substitute for creamy sauces especially if you have a nut allergy. This recipe is quite easy to make but so filling and tastes like you’ve been working on it for HOURS! I mean, look at that creaminess! 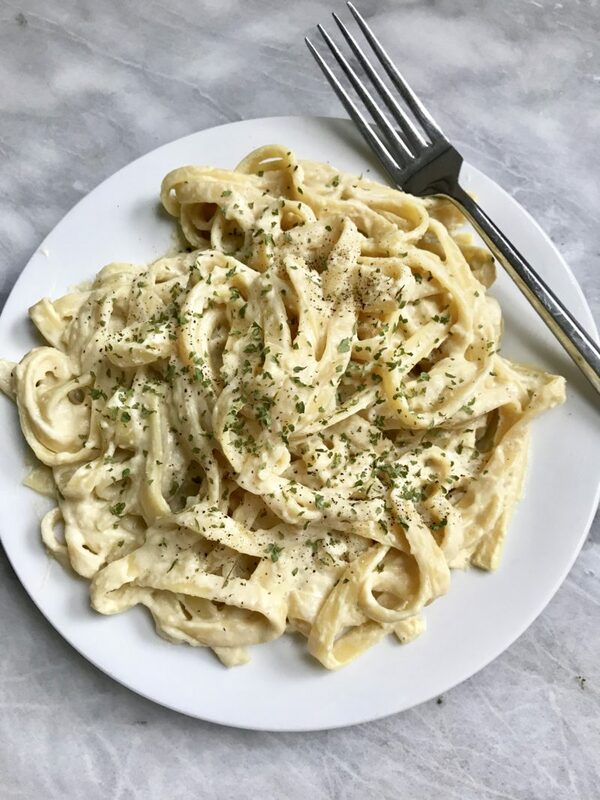 I love this recipe because it is healthier than your traditional alfredo sauce and completely cruelty free. Thinly chop up your onion and garlic. In a large sauté pan, melt your vegan butter. On low heat, sauté your onion and garlic stirring often. Let your onions caramelize, which takes around 20 minutes. While your onions and garlic are cooking, bring two pots to a boil. Cook your cauliflower until tender and fettuccine according to package instructions. When your cauliflower is done cooking, add them to a blender with your onions & garlic, and rest of your ingredients. Blend until smooth. Add plant milk gradually until your desired thickness. Bring your sauce back to your sauté pan and turn the heat on low. Heat sauce and add your fettuccine to the sauté pan. Stir the fettuccine into the sauce and add vegan parm if desired. This sound spectacular. Trying it this week!! How much does this serve? I’m making it tomorrow! What brand of vegan cream cheese do you recommend? I am so glad you enjoyed, Gladys!